Federalist No. 9 is an essay by Alexander Hamilton, the ninth of The Federalist Papers. It was published on November 21, 1787 under the pseudonym Publius, the name under which all The Federalist papers were published. Federalist No. 9 is titled "The Union as a Safeguard Against Domestic Faction and Insurrection". The same subject is continued in the subsequent paper by James Madison, Federalist No. 10. Similar to Federalist No. 51, this paper emphasizes the importance of establishing a system of checks and balances in order to ensure that the government is intact and operating smoothly. A major aspect of Federalist No. 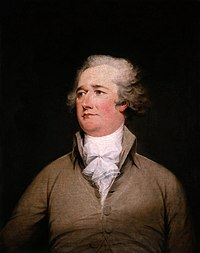 9 is Hamilton's response to the common Anti-Federalist argument based on the theories of Montesquieu, who wrote famously in his The Spirit of the Laws that "it is natural to a republic to have only a small territory, otherwise it cannot long subsist." The Anti-Federalist took his arguments to mean that the federal Union was bound to fail. Hamilton responded that if Montesquieu were taken literally, then since he was thinking of dimensions far smaller even than those of the states, the Americans would have to split themselves into "an infinity of little, jealous, clashing tumultuous commonwealths." Of the many different Federalist Papers, this one was perhaps one of the ones that faced the most opposition, mostly because of the vagueness and non-specific sentiment that was involved with it. More seriously, Hamilton contends that the confederated federal system described in the proposed Constitution would not suffer as Montesquieu predicted because of its de-centralized design. He further argues that Montesquieu himself proposed a confederation of republics as the solution. This Federalist Paper is also incredibly helpful in expressing the differences between the arguments that Hamilton makes and the arguments that Madison makes. This paper in particular works well to establish the precedent so that in the case of uprising and rebellion, the military has more force to suppress the uprisings. The reason that this was believed to be a significant component was because of Shays' Rebellion. Overall, Hamilton's idea of federalism stems from his belief that there should be ways of solving all problems that the government may have. This is seen through the checks and balances and the distribution of power that Hamilton suggests should be present in the U.S. This page was last edited on 8 March 2019, at 07:43 (UTC).